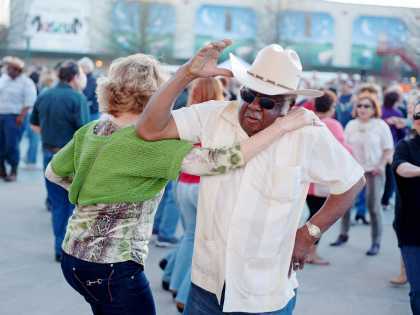 Known as the heart of Cajun & Creole Country, the unforgettable city of Lafayette epitomizes the rich history, great food and vibrant music of Louisiana. 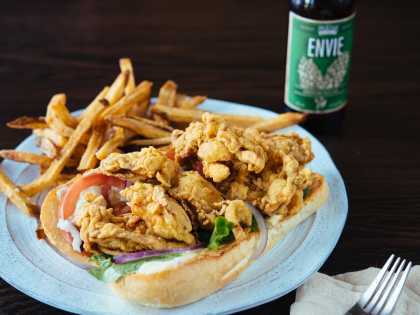 It also happens to be conveniently situated on the Mississippi Flyway and the Atchafalaya Loop of America’s Wetland Birding Trail. 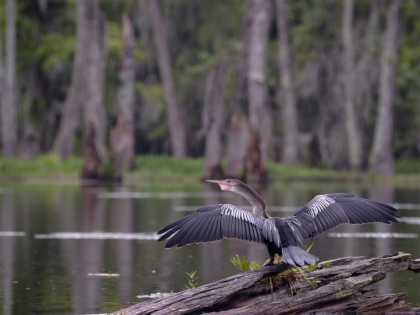 Nature watchers and photographers have immediate access to some of the best birding sites in North America, including Lake Martin, with its expansive shoreline and bottomland hardwood forest. At last count, birders have spotted 240 species here. In the evenings, snowy, great and cattle egrets, little blue herons, green herons and yellow-crowed night herons gather to roost. The enigmatic Swainson’s warbler is a gaping hole in many checklists, but they can be easily found at Indian Bayou Natural Area during the breeding season, along with swallow-tailed and Mississippi kites, anhingas and American alligators. Below is a guide of some of the birds you can expect to see when visiting Lafayette. These large, stark white wading birds can be found stalking prey along the shallow edges of nearly any water body in the area. 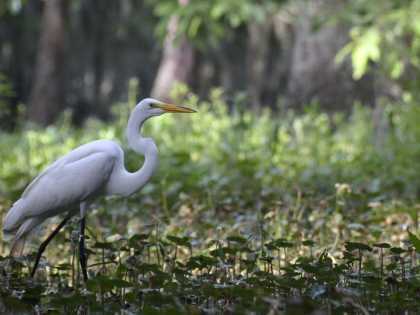 Their long, s-shaped necks, black legs and feet, and slender yellow beaks are the keys to telling this species apart from the similar Snowy Egrets and Cattle Egrets. Similar in appearance to the Great Egret, but much smaller in size and seen less frequently, the white-bodied snowy egret is distinguished by a black beak that changes to yellow near the eye, and black legs with distinct yellow feet. They can be spotted hunting prey in still, shallow waters across the region. 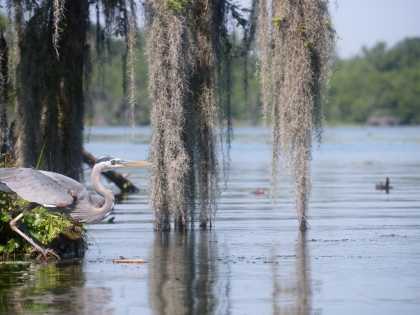 A large, slate blue bird, the Great Blue Heron is generally seen wading slowly in shallow waters, searching for prey. To identify, look for a long, thick yellow bill, and a stripe of dark blue to black that runs from just over the eye to the back of the head, and extends back behind the head in the form of a few wispy feathers. The Great Blue Heron has a long, s-shaped neck which it pulls back towards the body in flight. 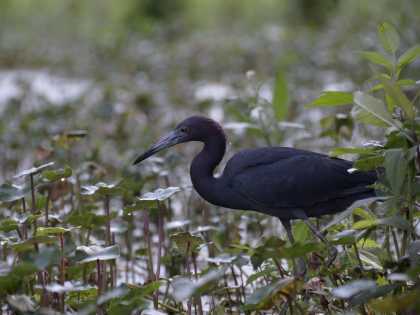 Much smaller and darker than the Great Blue Heron, the Little Blue Heron has a solid dark blue body with a slightly reddish or purplish neck. Its legs and feet are black, and the beak is black at the tip and lighter bluish-grey near the face. 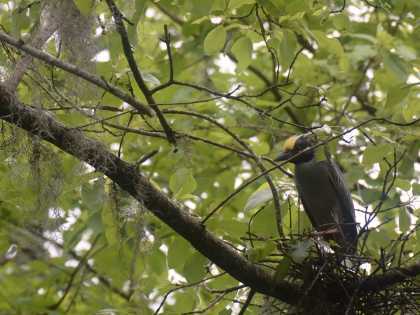 Look for the beak and leg coloration to correctly identify immature Little Blue Herons, which start out white in color. As they mature, their white bodies will slowly gain a more mottled appearance as they become increasingly dark blue in color. A small, squatty bird, the Green Heron generally keeps its neck pulled back close to the body, both in flight and while wading. This bird has a greenish-black crown and back, maroon neck and chest, and bright orange to yellow legs and feet. 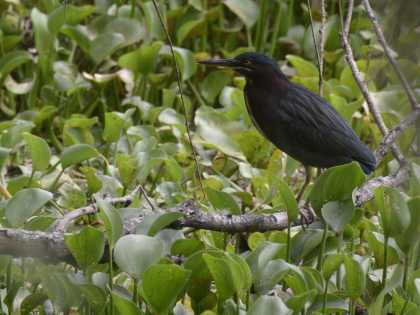 Look for them along the shallow edges of fresh water bodies where cover provided by vegetation is plentiful. 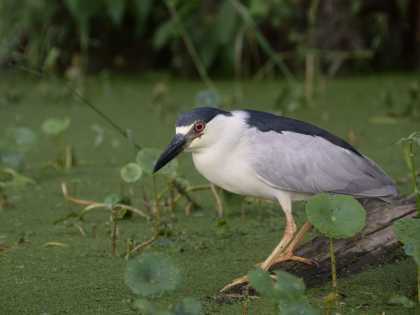 Another squatty heron that generally keeps its neck pulled back close to the body, the Black-Crowned Night-Heron is easy to identify based on its shape, as well as coloration. It is medium sized, and has a thick, black beak, dark bluish-black crown and back, pale grey wings, and a white neck and chest. A few plume-like white feathers extend back from the head. The Yellow-Crowned Night-Heron is similar in size and shape to the Black-Crowned Night-Heron, but with an easily identifiable color pattern. It has an all grey body, and a dark bluish-black head with a white stripe along the cheek and a very pale yellow (sometimes so pale that it appears white) crown that extends back from the head in the form of a few wispy feathers. The bill is thick and black, and the wing feathers have a grey and black striped appearance. 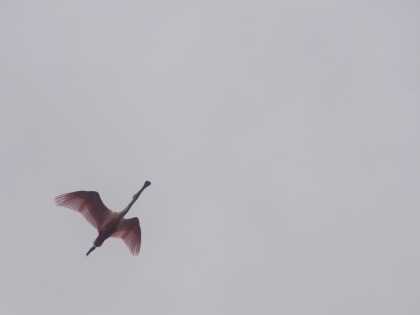 The roseate spoonbill is a large, visually striking bird, having a pink body with red patches on wings, a white neck, and a flat, spoon-shaped bill. They are often seen perched in trees in swampy areas, foraging in shallow fresh or salt water, or flying in small groups overhead. Anhingas are long necked birds that hunt aquatic prey by swimming underwater or at the surface. At times, they swim with their bodies underwater, leaving only their necks and heads exposed, giving them a snake-like look. For this reason, they are often called snakebirds. They are commonly seen in cypress swamps, perched on a log or in a tree with wings extended to dry their water-logged feathers. They are black bodied, with white markings on the upper wings, and have long, pointed, yellow bills and fan-shaped tails with white tips. Female Anhingas have a lighter brown head and neck. The male Wood Duck is considered by many to be one of the most beautiful waterfowl. They have large, iridescent green crested heads, bright orange eyes, an orange bill with a black tip, and black cheeks with two white stripes leading down to a white neck. Their chest is a dark reddish brown mottled with small white spots, their back and tail are dark greenish black, and their sides are light tan. The female is less colorful, with a grey head with a slight crest, white eye patch around a dark eye, and a mottled grey-brown body with blue patches on their wings. 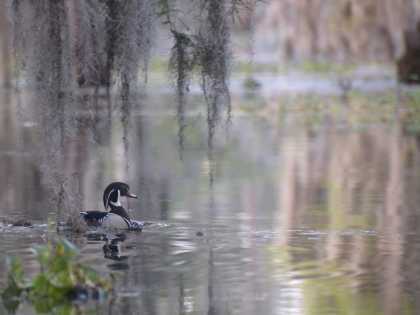 Wood Ducks are often seen in wooded wetlands, and will nest in manmade nesting boxes if provided. These coastal birds are found foraging in coastal waters, perching on fishing docks, jetties, or offshore rigs, or flying in flocks along the shoreline, often in a V-shaped pattern. 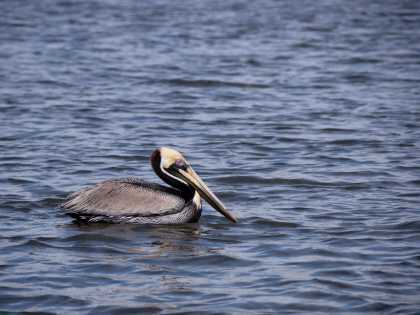 The Brown Pelican, Louisiana’s state bird, is a large, stocky bird with a very long bill. They are greyish brown with a pale-yellow head and white neck. They feed by diving from high in the air headfirst into the water, scooping up fish with their large bill and expanding throat pouches. Brown Pelicans were once an endangered species due to the use of DDT and other harmful pesticides, but populations have made a strong recovery once the use of these chemicals was stopped. 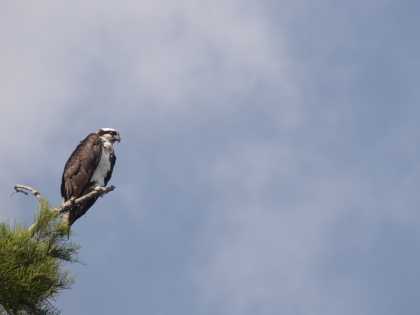 A very large raptor, the Osprey feeds primarily on fish, therefore they are generally found nesting at the tops of tall, dead trees or poles in open areas near any type of water body. They hunt along the water’s surface by diving in feet first to catch their prey. Their back and the top of its wings are dark brown, while their chest and legs are white, and the underside of the wing is white with brown patches. The white head has a prominent brown stripe leading from the eye to the back of the head. The bill is dark and sharply curved. 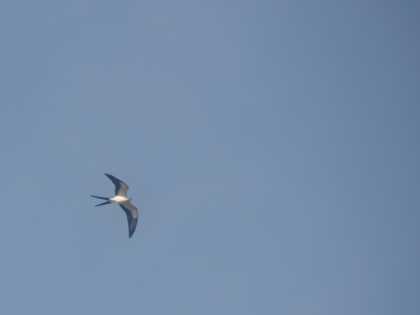 Swallow-tailed Kites are also Spring to Summer visitors to Louisiana, and are like Mississippi Kites in their size and wing shape. 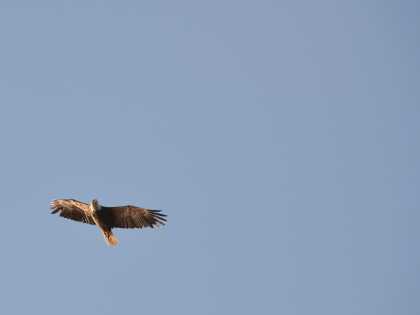 They can be identified by their distinctive forked tail shape, as opposed to the triangle shaped tail of the Mississippi Kites. Their highly contrasting black and white coloration is also distinctive. They have white heads and necks with black wings and tails. From underneath, their chest, belly and leading edge of the wings are white, while the tips and trailing edges of the wings, and the elongated forks of the tail are black. Their eyes are orange, and their short bills are pale grey with a dark, curved tip. While most people are familiar with its appearance, many misidentify other large raptors as being Bald Eagles when viewed from afar. This bird is seen most often in the Fall and Winter months in our area, and has a solid dark brown body and legs, with a solid white head and tail. Its feet and sharply curved beak are bright yellow. The Bald Eagle is the national bird of the United States, and is considered sacred by many Native American tribes. Barred Owls are medium sized, stocky birds with rounded heads and no ear tufts. 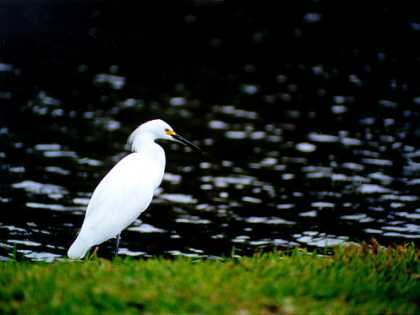 They have a pale white face with dark eyes surrounded by a dark ring, and a yellow beak. Their chest is white with a brown striped/mottled appearance. On the upper chest, the stripes run horizontally and on the belly the stripes run vertically. Their back and wings are darker brown stippled with white. They can be found perching in trees in wooded areas and in forested swamps, and as dusk begins to fall, listen for their distinctive “Who cooks for you, who cooks for you-all” call. 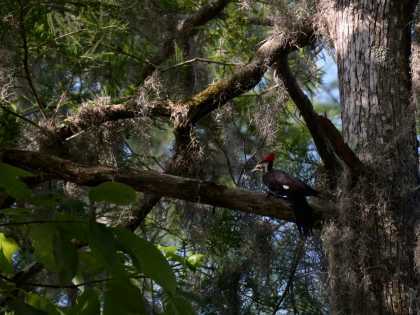 The Pileated Woodpecker is the second largest woodpecker species in the United States, behind only the possibly extinct Ivory-Billed Woodpecker. It is about twice the size of the Red-headed and Red-bellied Woodpeckers, and has a very distinctive red crest on its head. Its cheeks are black and white striped, and males have a red stripe running back from the base of their beak. The body is solid black, while the tops of the wings are black with small white patches, and the undersides have large white patches on the leading edge of the wing, and are black along the trailing edges. 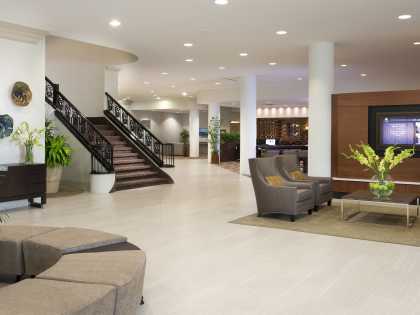 They nest in large cavities carved out of trees, the opening holes of which are very large, about 4 inches in diameter. 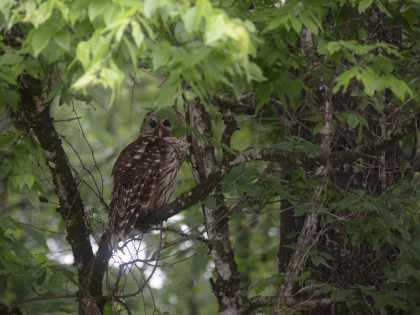 Look for these birds and their nest cavities in dead trees in wooded areas, as well as in forested swamps, and listen for loud thud of their tapping on tree trucks, which can be heard from some distance. 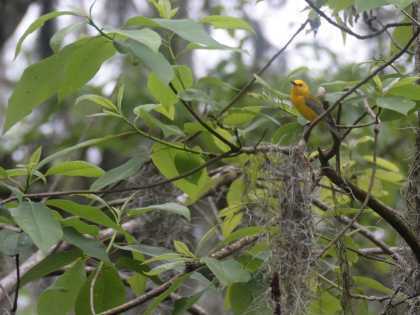 This bird is a Spring and Summer visitor to our area, and can be spotted in lower branches of forested swamps, or in woodlands near lakes or streams. The Prothonotary Warbler is a small songbird, though large relative to other warblers, and has a bright yellow head and breast. Its eyes and beak are black, its back is a yellowish-grey, and it’s wings a bluish-grey. If seen from below, look for a white patch under the tail. 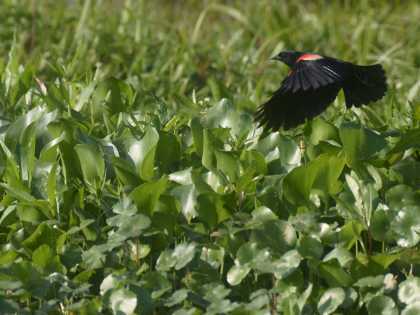 The Red-winged Blackbird is a very common and abundant bird, particularly in open areas perched on wires along roadsides, or on cattails or other vegetation in marshy areas. The females are a less conspicuous brown streaked with white, with a white streak leading from the eye to the back of the head, and a slight rusty-red coloration on the throat and shoulders that can be difficult to see in the field. The males, however, are unmistakable in appearance- solid black with bright red shoulder patches with a yellow bar at the base of the red patch. The thick, stocky beak is black, as are the eye, legs, and feet. They can form huge flocks, particularly in the winter months, when they feed on grains in open fields. 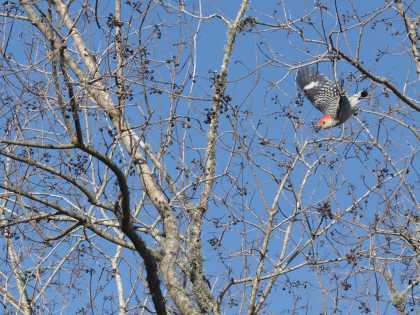 The Red-bellied woodpecker is an example of a bird whose name is misleading. These woodpeckers have a red patch leading from the bill down the crest of the head to the back of their necks, with light grey around the eyes, on the cheeks, and down the front of the neck and breast. The red patch on the head of the female is on the back of the neck, with a second small patch just above the bill. The belly is not prominently red; instead it is the same light grey as the neck, sometimes having the slightest reddish tinge, which can be very difficult to see. The wings and tail are black with a white barred pattern. 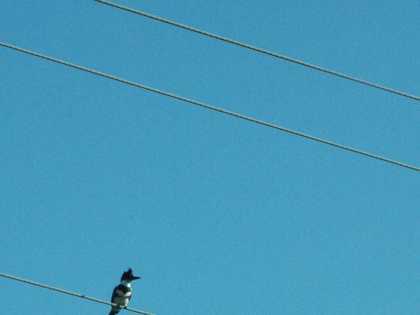 The Belted Kingfisher is a small, stocky bird found along the edges of nearly any type of water body. Look for them perched on tree branches, or swooping down to the water’s surface to catch a fish with its long, thick bill. Its head is slate-blue, with a large, slightly ragged crest. The eye and beak are dark, and the back, upper wings, and tail are the same slate-blue as the head. The underside of the wings, the neck, and the belly are white, with a ring of slate blue around the chest. Females have an additional, lower ring around the chest that is rusty orange. Their chattering call is distinct, and can often be heard before the birds are seen.